NACA’s American Dream Tour stops in Los Angeles, California for a five day event, Friday, October 10th through Tuesday, October 14th at the Westin Bonaventure Hotel, 404 S. Figueroa Street, Los Angeles, CA 90071. The event will run from 8am to 6pm all five days. The NACA Home Save and Home Purchase programs will both be represented at the event. The Home Save Program gives homeowners with an unaffordable mortgage the opportunity to get their mortgage restructured to an affordable payment and avoid foreclosure. Representatives of all the major lenders will be on hand as well as investors Fannie Mae and Freddie Mac so that many homeowners can receive a same-day solution to their mortgage problems. The Home Purchase Program allows potential home buyers to obtain “America’s Best Mortgage” with no down payment, no closing costs, no points and always at a below market interest rate on a fixed rate, 30-year loan. Today’s rate (as of 8/26/2014) is 3.875%. NACA’s American Dream Events are always free, open to the public, and there is no charge for NACA’s services. More information and registration for this and all of NACA’s scheduled American Dream Events can be found on our website at http://www.naca.com. While advance registration is preferred, walk-ins are also welcome. NACA’s American Dream Tour stops in Ontario, California for a five day event, Friday, October 17th through Tuesday, October 21st at the Ontario Convention Center, 2000 E. Convention Center Way, Ontario, CA 91764. The event will run from 8am to 6pm all five days. The NACA Home Save and Home Purchase programs will both be represented at the event. NACA’s American Dream Tour stops in Cincinnati, Ohio for a five day event, Friday, November 14th through Tuesday, November 18th at the Duke Energy Convention Center, 525 Elm St, Cincinnati, OH 452024. The event will run from 8am to 6pm all five days. The NACA Home Save and Home Purchase programs will both be represented at the event. The Home Purchase Program allows potential home buyers to obtain “America’s Best Mortgage” with no down payment, no closing costs, no points and always at a below market interest rate on a fixed rate, 30-year loan. Today’s rate (as of 10/8/2014) is 3.75%. NACA’s game-changing 15-year Wealth Building Home Loan is also available, with a starting rate 0.75% lower than the 30-year rate and the ability to buy the interest rate down to nearly zero. ATTENTION MASSACHUSETTS AND NEW HAMPSHIRE HOMEOWNERS! 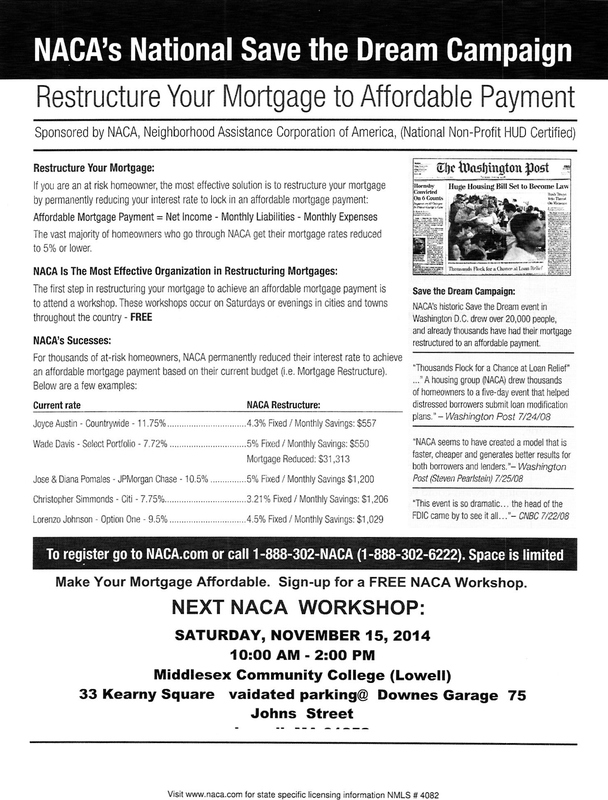 NACA will be conducting a special HOME SAVE workshop on Saturday November 15th at Middlesex Community College in Lowell, MA, starting at 10:00am. Anyone with an unaffordable mortgage, late on their mortgage or facing foreclosure should attend. NACA’s American Dream Tour stops in Miami, Florida for a five day event, Friday, July 24th through Tuesday, July 28th at the Miami Beach Convention Center, 1901 Convention Center Drive, Miami Beach, FL 33139 . The event will run from 8am to 6pm all five days. The NACA Home Save and Home Purchase programs will both be represented at the event. The Home Purchase Program allows potential home buyers to obtain “America’s Best Mortgage” with no down payment, no closing costs, no points and always at a below market interest rate on a fixed rate, 30-year loan. Today’s rate (as of 7/6/15) is 3.875% for the NACA 30-year mortgage and 3.125% for the incredible 15-year NACA Freedom Mortgage.